Drop one game late to a rival? Fine. Two games in a row? Now that’s a different story. 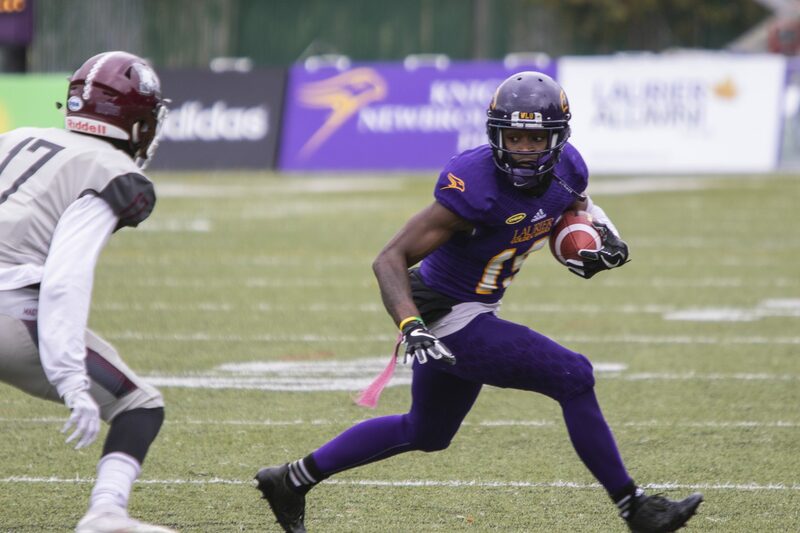 Following a loss to the Waterloo Warriors after being outscored 17-3 in the fourth quarter, the Laurier Golden Hawks had another game slip through their fingers to McMaster in a sloppy 21-20 loss in Hamilton. “Well I just find the last two games, the opponent played well but I will say I feel like those are two games we should have won. Reality is, we had a 12-point lead against Waterloo and we had a 9-point lead against McMaster and in both games, we didn’t find a way to win the football game,” coach Faulds said. Starting out smooth, the Golden Hawks didn’t have too many issues moving the ball, thanks in large part to their run game led by fourth year Mississauga native, Levondre Gordon. After a 12 play, 72 yard touchdown drive halfway through the first quarter though, McMaster would catch a big break. Letting the ball hit the turf on a punt, Kurleigh Gittens Jr. got out-hustled by Marauder linebacker Jayden Lawson who hit the ball out of bounds to get his team the ball back at the Laurier 23-yard line. Following that, it would take three plays for the Marauders to capitalize, as running back Jordan Lyons would close the drive with a two yard run into the end-zone to tie the game. In the second, after a Nathan Mesher punt that was only returned to their own 9-yard line, the Marauders were forced to take a safety as Laurier held them to just one yard on the possession. Following the safety, the Golden Hawks would march on an eight play, 75-yard drive that would be ended off with a strong catch by Brentyn Hall in the right corner of the end-zone, ripping the ball away from the defender’s hands, followed by a stare down only suited for such a play. Nathan Mesher missing his 43-yard attempt wide left with less than a minute to go, down 21-19, would close the game. “I thought our defence played outstanding. The offence took a step back. Our offence didn’t play up to par,” Faulds said. “This is a playoff game. Playoffs have started. We’re still in September, you like to think that the playoffs don’t begin until the end of October but the reality is we cannot afford to go 2-3,” Faulds said.